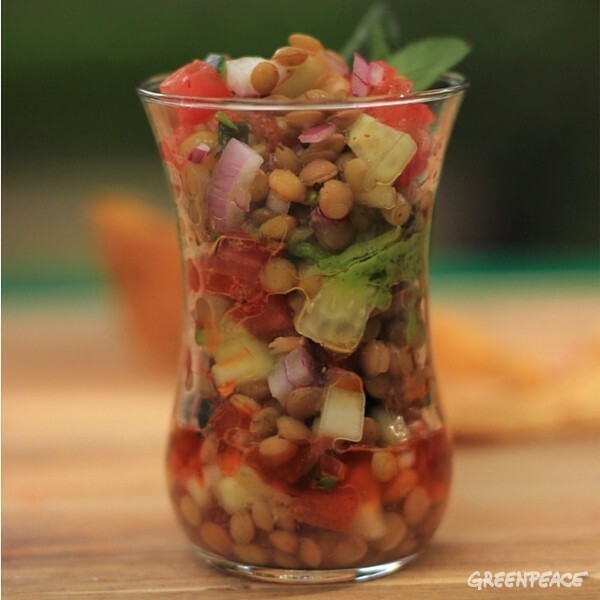 How can the food you eat help protect the planet and improve the lives of people? Eating is one of the most impactful human activities. From reducing meat consumption to supporting local farmers, every bite we take makes a difference. 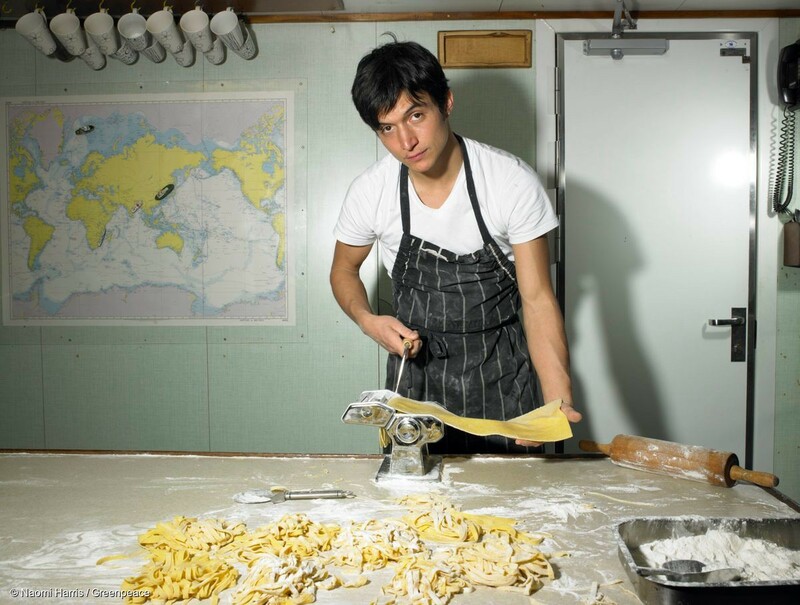 We interviewed chef Daniel Bravo, who has been part of the Greenpeace fleet for 13 years. Besides being responsible for the culinary celebrations on board, Daniel engages locally with movements of independent food sovereignty and is always supporting sustainable farming. His mission is to show the world that by changing our food habits, our purchasing and our nutrition, we can bring pride to local farmers and create a healthier, more equal society. What foods did you eat and love growing up? 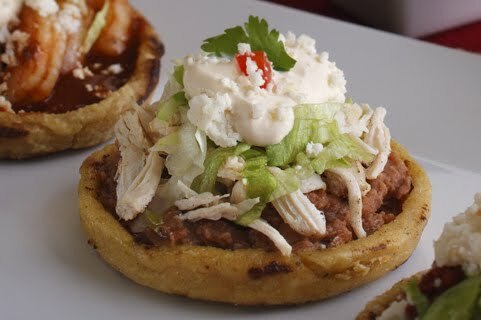 As a kid I remember smelling nutmeg and eating “sopes with black beans” after school in my grandmother’s kitchen; or my mom’s “chilaquiles with spicy tomato sauce”. My father had a small vegetable garden and it was one of my favourite places. When the cherry tomatoes were ripe and sweet, I’d sneak out with my sister to eat them. I loved everything about that place: the smell, the taste, and all the life thriving in the greenhouse was just mesmerising: butterflies, insects, birds… just nature at it’s purest. 2. There are many reasons why people become vegan. What was yours? Vegan, vegetarian, omnivore… these are just labels to separate us in society. What is important is to understand how industrial food production is destroying our planet and everything living on it. Farming crops destined to feed livestock are causing deforestation and displacing Indigenous groups. The agrochemicals this industry use to grow crops poison the soil, the water, affecting the life that depends on it. Animals become products instead of living beings. I know how industrial farming worsens the effects of climate change. I’ve seen glaciers in the Arctic and I know my grandchildren might never see one. I know how droughts and floods are affecting the most vulnerable around the world. This is why choosing what to eat is important. 3. When did you decide to become a chef and particularly a vegan chef? What inspired you? I feel extremely fortunate to have lived in an environment where food was a source of love. My father would take me to places where he had eaten with his father. My grandmother would prepare incredible feasts to celebrate her grandchildren’s birthdays. So, from a very young age I started experimenting with food. 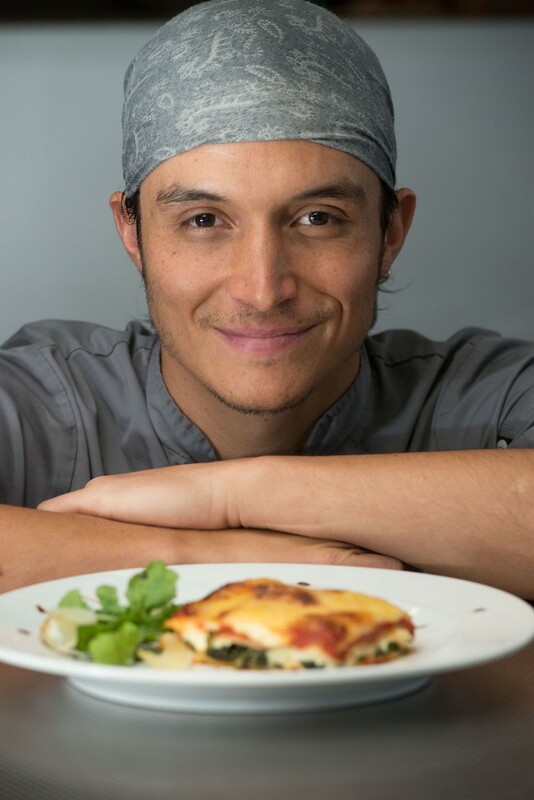 I started working for a small family business and decided to make a career as a chef. After many years in the industry and with more understanding of nature and the food process, it was clear to me that I needed to find a way to contribute to the planet in a deeper way. So I joined Greenpeace as a volunteer and activist and ended up on the Arctic Sunrise as a cook’s assistant. 4. You’ve been working onboard of the Rainbow Warrior for a while. How do you ensure dishes are varied, even when you spend days in the open sea? What’s the crew’s favorite meal? Traveling around the world with Greenpeace has given me an unique opportunity to expand my knowledge. I’ve tried different cuisines and ingredients and learned so much from different cultures. The farmer’s markets offer so much! The richness and freshness makes cooking a bliss. When we depart though, is when the challenge begins, and when creativity and knowledge comes in hand! My grandma used to say “a good cook is not the one who can make a fantastic meal with fancy ingredients, but the one who can make a great meal with whatever is available”. The crew loves this lentils ceviche recipe. It is tasty, nutritious and healthy. Making a dish like that — with sustainable food — is my “mantra”. 5. What’s the hardest thing about cooking on a ship? However, the hardest thing by far is to leave your loved ones on land. Knowing that there is very little you can do during an emergency, or just simple things like hugging my daughter when she’s sad or scared. It is heartbreaking. After all these years being away, I learned to appreciate the moments with them and make them precious and unique. 6. You’ve met many inspiring people while traveling with the Rainbow Warrior. Who was the most inspiring person you’ve met? On every trip I meet amazing people: activists and volunteers who inspire me with their commitment and passion for the environment; cook assistants who are willing to work on one of the toughest jobs on board because they want to make a change; farmers who live their lives so close to nature. In every country I visit, the small farmers keep giving me an extraordinary example of how we can change the world. I cannot name only one person, but all these people are proof we can plant a seed that can change the world. 7. You’re an advocate for sustainable farming and sustainable food. What does it mean and why is it important to you? For decades, industrial agriculture has been portrayed as the solution to hunger in the world, but it’s obviously not true. The current food system causes deforestation, soil erosion, biodiversity loss, water pollution and worsens the effects of climate change. Small farmers and landless farm workers are extremely affected by industrial agriculture, being amongst the poorest and malnourished people in the world. This is why I believe ecological agriculture is key to make change happen. Local crops create an integrated system where everything is in balance and the farmland supports natural biodiversity. 8. What impacts of industrial agriculture have you seen in your travels? I’ve visited small towns with children suffering from diseases related to the use of agrochemicals. Or small farmers having to abandon their fields because they cannot compete with the prices of industrial agriculture. Don Simon, a leader from the Indigenous Wichi group from Salta, Argentina. 9. What is the biggest myth about cooking plant-based foods that you encounter? That it’s tasteless, makes you feel weak, doesn’t have enough proteins and nutrients, or that it’s not going to make any difference for the planet or the people. I can definitely say that plant-based food is not tasteless! It all depends on how you prepare it. And instead of making you weaker, you will actually feel healthier and lighter, because by following a plant-based diet you will many more different kinds of food, with many more nutrients. The most important thing, though, is to acknowledge that everything we do has an impact on our lives and on the planet, including every bite we take. 10. Can you share your favourite recipe with us? Quinoa and seaweed croquettes is one of my favourite recipes because of the story behind it. The importance of seaweed for the coastal communities and their environment, the richness of nutrients and the availability as a multi nutrient product for the people that can’t afford obtaining them from other sources. Feeding Freedom — a project Daniel Bravo is engaged with — empowers sustainable farmers around the world and tell their stories. Click here if you want to follow Daniel and learn more about his work.